Marks & Spencer has just made its first move into mobile commerce, and unlike some other UK retailers, it has opted for a mobile website rather than an app. M&S says this is a ‘major step forward in mobile retailing’, a move which will change the mobile retail landscape. The homepage on the mobile site is clearly laid out and M&S has kept it nice and simple, with a prominent search box and a simple list of seven product categories to navigate to. For those visitors that just want to find their nearest store, there is a clear link to the store finder at the top of the page. As well as providing another sales and research channel for customers, mobile sites and apps can also be a way to drive sales through local stores, and one way to do this is by providing a store locator. This is one area where apps can be more useful, since this mobile site doesn’t detect my location and serve up the stores nearest to me. Still, tapping in the first part of a postcode isn’t too difficult to do. I can also search for stores by street, town or by name, and also look only for stores which offer certain services, such as a cafe or bureau de change. The opening hours are provided, as well as contact details, a list of services on offer, as well as links to maps and driving directions. Navigation on the app is clear and simple. Categories have been laid out in list form, which makes them easier to scan, and to click or tap on. There are also enough sub-categories so that users don’t end up with too many products to scroll through. For instance, to get from the ‘mens’ category to formal shirts takes four clicks. This means a more accurate browsing experience, though the flipside is that it takes a little longer to get there. Once users get to this point, the product list is easy enough to scroll down, with the product title, price, available colours, and small photos to give a quick view of products. There are also more options to sort results. The site search works well enough, handling common misspellings and producing accurate results for the terms I tried, though the search results pages need more filtering and sorting options for common search terms. For instance, a search for ‘blue shirt’ produces 647 results, which are split over 54 pages, with the only sorting options being price, bestselling, and recent arrivals, which doesn’t help users narrow the selection enough. 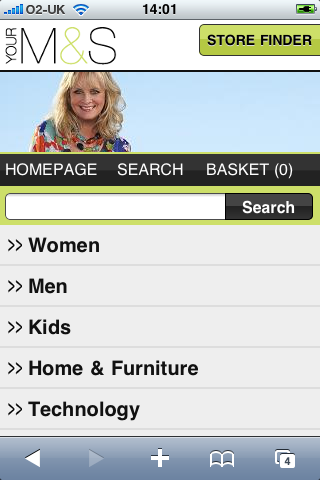 The product pages are as detailed as any I have seen on a mobile site, and cover just about all bases. Delivery and returns information has to be viewed via a link. In the case of delivery charges, since there are only two price options, it might have been better to display this directly on the product page to save time spent loading up the page. This is the point at which a lot of mobile commerce sites and apps disappoint by simply tacking on the checkout from the main website, but M&S has a checkout that has been optimised for mobiles. However, it does insist on registration before checkout for new customers, which is even more of a barrier to purchase on mobiles than it is on standard websites. This is a move which could deter some new visitors from purchase, especially as it can be a bit fiddly. My passwords didn’t match initially, but you only see this error message when you scroll down the page; it isn’t made clear enough. While the process has been adapted for mobile users, and data entry is simple enough, and the forms are easy to navigate. However, there are still a few areas where it could be made simpler. For instance, when selecting delivery options, you have a choice between standard and nominated day delivery, but you still have to load another page (slowly) to see the charges, and then hit the back button to get back to the checkout. This is time-consuming on variable mobile connections, and unnecessary. Even existing customers have to re-enter their card numbers, though the site promises that future payments will be smoother, as details will be stored. Worse still, the most prominent link on the page sends users back to the shopping basket, meaning users have to sign in all over again and select delivery address and options to return to where they were before. While the checkout process has been adapted for mobile users, there is still a lot that M&S can do to remove some of the friction that exists, and that may cause some customers to abandon the process. After this move into mobile commerce from M&S, it will be interesting to see how many others follow suit, as there are still plenty of retailers in the UK yet to move into mobile commerce. I think the decision to launch a mobile commerce site instead of an app is the right one, as it appeals to the broadest possible number of customers, though in the case of a large retailer like M&S, having an app as well may make sense. A mobile site is the best first step though. While the overall site design and navigation is excellent, I think the checkout process does let it down, thanks to compulsory registration, text-heavy pages, and the help pages leading to dead ends. Google TV: will it finally deliver television-web convergence? For nearly as long as the internet has been available to the general public, entrepreneurs and technologists have dreamed of the convergence of the television and the web. From WebTV to today’s internet-enabled gaming consoles, the small screen and the internet have been introduced to each other. But the type of convergence that many have predicted and sought to create has remained elusive. The world’s biggest search engine, however, hopes to change that. The battle between ‘open’ and ‘closed’ on the web started years ago. upstarts alike fight for supremacy in markets new and old. If you’re a local merchant with a bricks-and-mortar presence, it’s time to kiss the yellow pages goodbye. There’s no longer any excuse for not having a web presence or for ignoring digital marketing. Eighty-two percent of people use search engines to find information about local businesses – more than any other media. Even if you don’t have a website (you should, but that’s another story), there are six sites no local business can afford to ignore. Not only is getting listed dead simple, it’s a great leveler. If you own a pizza place, you can compete head-to-head with national chains like Dominos. Hardware? Go up against Home Depot and Lowes. You get the idea. Claiming your business and getting listed and on all five of the Big Six should only take an hour or so (though most require you wait for a postcard or phone call o verify that you are who you say you are). Once you’ve enlisted, and taken advantage of some of the special features these sites offer (mostly for free), you’ll reap many advantages. You’ll have a presence in organic search results, not only on the web, but also on mobile platforms. You can offer special deals and inducements to lure new business, you can encourage positive reviews and, to a degree, manage your online reputation. You can precisely map your location and help people to find it, and broadcast your hours of operation. And you’ll have access to analytics that can inform you of the keywords used to find your business, the time of day people search for you and other data that can help improve your online presence, offers and advertising and promotional campaigns. With a near-zero investment of time and money, there’s absolutely no excuse to not get started with The Big Six.